Offer a unique, refined and personalized gift. A perfect Christmas gift for a friend, brother, father, or husband. Choose from 5 fonts and have your personalized message engraved on an original and practical Christmas gift. 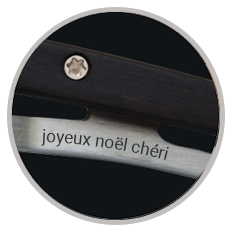 For just a few minutes and with ease, Deejo invites you for Christmas to create and tattoo a unique and original pocket knife that resembles each member of your family. A beautiful gift for men but also for women. 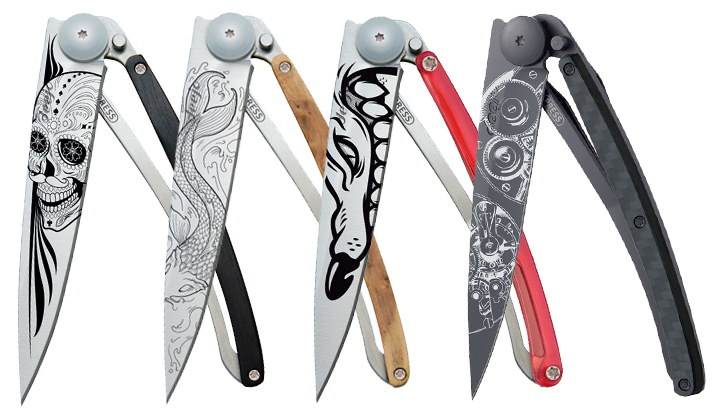 Choose from 3 sizes of knives, 3 steel finishes, 15 handles, and more than 60 tattoos to create a Deejo knife that resembles you. 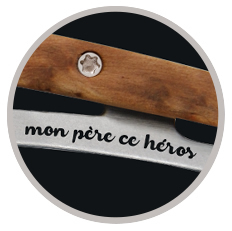 For the hunter dad, the biker brother, the sister of heroic fantastical imagination, or for your companion on the lookout for new and innovative trends, discover the motif that will please him or her among dozens of graphic universes that will make your Deejo knife a personal and an unforgettable Christmas gift. If you want to give this gift to a man, consider the 37G version, for size and comfort, comparable to that of a table knife, particularly convenient for the every day. For the woman or man who moves a lot, the 27G and 15G models are more compact and carried more easily. Carefully select your tattoo with your recipient in mind: tattooing his or her Deejo, like the traditional tattoo on skin, gives identity to this beautiful gift, bearing on its blade the spirit of its owner. Alternate the mirror, titanium, and black titanium finishes to appreciate the rendering of each tattoo, selecting one that fits your chosen motif. 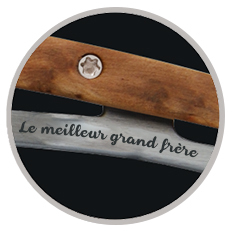 Select a handle for your Deejo knife: will you opt for the warmth of wood? For a bright easily spotted color? For the technical material of carbon fiber? Or will you prefer the purity and simplicity of our Deejo “naked” knives, without a handle plate? 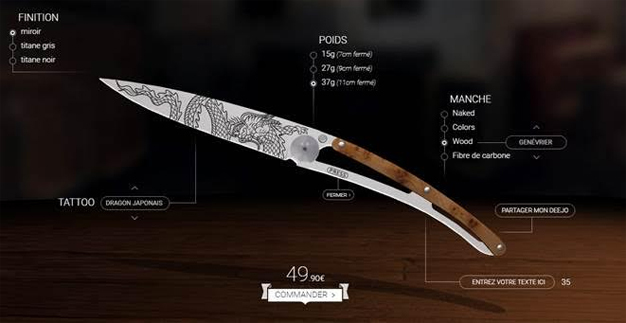 Finally, add the final touch of your customization with a dedication engraved on the handle: 35 characters, 5 fonts and your imagination are your only limits to compose the dedication that will remain etched forever on this fine blade. In only a few days, your Christmas gift is prepared and shipped with care from our Parisian ateliers directly to the address of your choice. Note that each Deejo comes with a microfiber cover and in an elegant gift box. Deejo offers also a broad range of accessories to complete your gift: genuine leather cases, sharpener, collector’s box... All that remains for you is to giftwrap your Deejo, place your gift beneath the Christmas tree, and watch the delighted face of its happy owner.